The McGill University Health Centre (MUHC) announces the exceptional contributions of ten individuals and one team as part of its second annual MUHC Director General’s Awards, the jewel in the crown of the organization’s Employee Recognition Programme. Over 1,000 members of the MUHC and special guests, including Quebec’s Minister of Health and Social Services, Dr.Yves Bolduc, honoured the winners and nominees at a gala at the Fairmont Queen Elizabeth Hotel on Saturday. The MUHC Director General’s Awards were inaugurated in spring 2009 with a MUHC-wide call for nominations, an overwhelmingly positive response and an entertaining fall gala that galvanized employee morale. 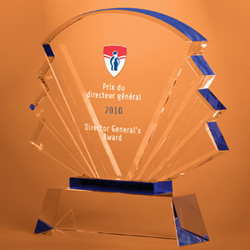 The initiative was recognized in 2010 with a Human Resources Award of Excellence from theAssociation québécoise d’établissements de santé et de services sociaux (AQESSS). Submissions for the 2010 awards also flowed in, explaining how individuals or teams are altruistic; how they have a positive impact on the organization, on patients and within their departments; and how they take initiative outside of their regular duties. A multidisciplinary committee then chose the winners. Saturday’s gala was also an opportunity for those shaping the new McGill University Health Centre to enjoy the pleasure of each other’s company and remember that while they may work at different locations, it is ultimately their collective efforts that allow their organization to constantly improve the quality, safety and accessibility of patient care, research, teaching and technology assessment. The gala was made possible by the generosity of award category sponsors, as well as gold co-sponsors Bell and Cisco, and silver sponsors, Diamond Taxi, Raymond Chabot Grant Thornton, Sodexo, TELUS Health Solutions, and Xerox. Borden Ladner Gervais sponsored the Team Award; IBM, Lenovo and Metafore the Management Award; La Capitale Groupe Financier the Nursing Award; SNC-Lavalin and Dessau the Professional Personnel Award; and ThermoFisher Scientific the Research Institute Award. Gold and Silver sponsors covered other expenses, including printing, entertainment and photography.